“Noncompliant”, Kathryn Havens, the Director of Women’s Health at the Milwaukee VA, reflected upon a veteran’s chart. “Hmm”, she thought to herself. “This patient normally does a great job of undertaking changes to improve her diabetes.” This qualifier, “non-compliant”, was a confusing one. It seemed at odds with what Kathryn knew of her patient. After reviewing her chart further, Kathryn the patient had stopped her medications though the chart told indicated no reason as to why. Kathryn quickly pulled the records from other patients with similar stories. And she soon realized that her team had a problem to solve. In order to provide the best care, her team needs to better understand the context in which Veterans live their lives so to create an experience that enables their adherence to their healthcare treatments in the least disruptive manner possible. 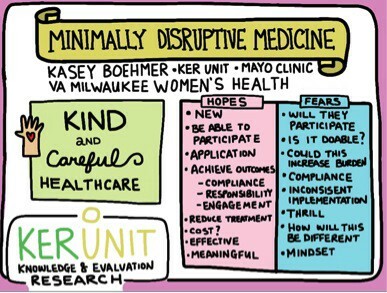 Therefore, the Milwaukee VA Women’s Health Clinic, along with representatives from the Chicago Hines Women’s Clinic representatives and Kasey Boehmer from Mayo Clinic’s Knowledge and Evaluation Research (KER) Unit, have begun a journey together to create the Minimally Disruptive Medicine project for women Veterans with diabetes and depression. As a practitioner, Minimally Disruptive Medicine is the idea that healthcare needs to fit into the lives of our patients. 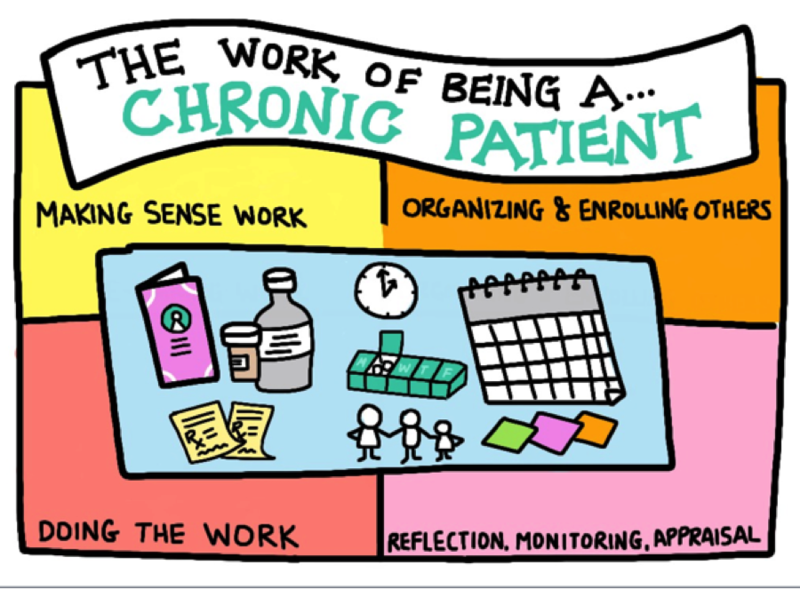 It is a lot of work to be a patient with chronic disease and then try to juggle life’s demands. 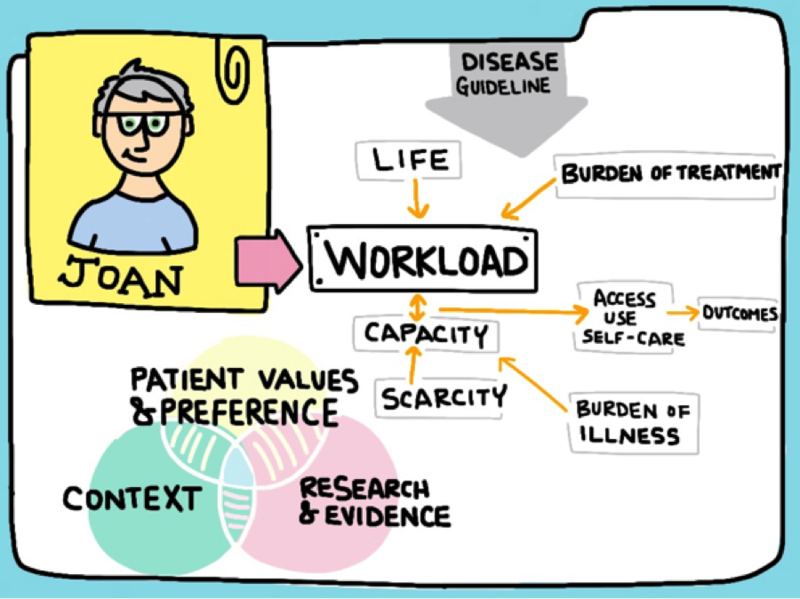 As caregivers, we need to assess the workload we are asking our patients to carry and respect their capacity to take on the work. If patients see their doctor once or twice a year how might a clinical team know a patient is experiencing such an event and is struggling to comply with clinical recommendations? How might a clinical team create care plans in that are respectful of a patient’s current situation and their capacity to comply with treatment options? The team has begun to design their Minimally Disruptive Medicine approach by re-defining our roles as healthcare professionals and also by integrating a “capacity coach.” Capacity considers how chronic illnesses and what it is required to care for them fits with a patient’s biography in a way that makes sense. Capacity considers the resources that the patient has at their fingertips, assisting them where they do not, or drawing on ones that do. Capacity considers the home and healthcare environment of the patient. And capacity is created with the social networks where the patient lives and works, and within a social setting in healthcare that gives permission to the capacity coach to help a patient with multiple chronic diseases prioritize their actions and medication, even if it means doing something that isn’t perfectly in alignment with guidelines. It is setting up experiments with a patient, with weekly interactions to create capacity thru the crisis and beyond. The treatment plan is co-created using a discussion aid called the “ICAN Discussion Aid” between the patient and their PACT (Patient Aligned Care Team) team members, which include the patients’ clinician, nurse, and coordinator to ensure this is the best care for what the patient values. It draws on considerable resources at the fingertips of the PACT Team (e.g., community referrals). The MDM/Diabetes project is starting this month at both Hines VA Medical Center and the Milwaukee VA Women’s health clinic. Women who choose to participate will have access to the designated capacity coaching pilot team. Coaching sessions will be available in-person or by video-chat. The goal is to realign the way we design care with patients at the center. For the next six months, this team will continue to provide care, iterate on its usefulness by engaging our patients in discussion, and build the program co-intentionally with them. The team expects that by creating treatment plans that fit patients’ lives and by helping create new capacity, patients will be able to better access and use healthcare and enact their self-care. Stay tuned! The team will create a toolkit so VA teams (and others!) can consider and apply a Minimally Disruptive Medicine model. Kathryn Havens, MD, is the Director of Women’s Health at the Milwaukee VA. She is also a 2015–2016 VA Innovation Specialist Fellow. Kristyn Ertl is a Clinical Research Coordinator. Learn more about the VA Innovators Network. The official Twitter feed of the VHA Innovation Ecosystem. Follows, tweets + RTs do not signify endorsement. Ideas within the VHA Innovation Ecosystem are generated through the VA Innovators Network, transformed into reality by the VHA Innovation Program, and then disseminated throughout the VA by the Diffusion of Excellence Initiative.